You are the heartbeat of what is created, discovered and watched on Periscope, and everyday we have the opportunity to step into your shoes and experience the world with you. The broadcasts you’ve shared have helped people find their niche and connected countless groups around similar interests and ideals. To recognize some of the top broadcasters who’ve been essential in helping shape our community, we’re rolling out the Periscope VIP Program. As a member of the VIP Program, you’ll have access to benefits that will help you grow your audience, increase your opportunities to collaborate with other broadcasters, identify you as a VIP broadcaster and equip you with tools to help you continue to create and share your live experiences. The VIP Program was designed for broadcasters who’ve invested in our platform and continue to share great live experiences on Periscope. If you’re new to Periscope or just starting out, our community is always changing and growing, and we encourage you to try a different format, share a new adventure and find your niche with likeminded broadcasters. Every broadcaster adds a unique perspective to Periscope, and we’ll always be on the lookout for new members to join the program. You can apply to join starting today and will see the program start to roll out in the coming weeks. 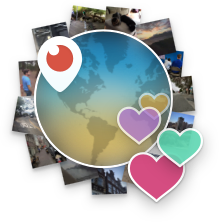 To learn more about the program or to apply, check out the Periscope VIP Program page. P.S. To learn more about creating and sharing great live video on Periscope, here are tips for broadcasting and growing your audience.